While the Honeywell HFD360B (AirGenius 6) is sometimes unavailable in Amazon store, the Honeywell AirGenius 5 HFD320 (AirGenius 5) is still the tactical flagship of this brand with an unique ifD air filter. Well, we are happy that we can finish the series of HFD Models in this Honeywell AirGenius 5 HFD320 Review (it has been 3 months to test all four of the HFD Models). If you are looking for the Honeywell HFD flagship, you should look for Honeywell AirGenius 6 HFD360B. As you’d expect of a flagship, this is the best Honeywell HFD Model yet, and despite the small improvements, Honeywell AirGenius 5 HFD320 is the ace to keep pace with Blueair Sense+ or GermGuardian CDAP5500BCA. If you own a Honeywell AirGenius 3 HFD300, or Honeywell AirGenius 4 HFD310 though, you may be best served holding out for later, when its successor, the HFD360B is pencilled in to arrive. Now, check out the Honeywell AirGenius 5 HFD320 Review. 2, Honeywell AirGenius 4 HFD310 Review. 3, Honeywell AirGenius 3 HFD300 Review. 4, Honeywell Compact AirGenius 4 HFD280B Review. Prepare to be confused. Just like Guardian Technologies and Blueair with their insanely similar products, Honeywell is stepping into this field with a trio of HFD Model air purifiers, including the Honeywell AirGenius 5 HFD320. With so much the same materials being used both outside and inside, Honeywell AirGenius 5 HFD320 is not a bump in the price compared with the Honeywell AirGenius 3 HFD300 or Honeywell AirGenius 4 HFD310. The original starting price is around $300, and reduces to only $229 in 2019. For the current price, Blueair Sense+ and GermGuardian CDAP5500BCA are the most competent rivals with this Honeywell AirGenius 5 HFD320, especially when they are packing with Smart features, something that you can only find from the best air purifiers of Honeywell, not this Honeywell AirGenius 5 HFD320. As usual, here is the latest deal of Honeywell AirGenius 5 HFD320 in 2019. Honeywell HFD320 – Honeywell AirGenius 5 Air Cleaner/Odor Reducer, Black Edition (with Energy Star qualified). Recommended for large rooms, 250 sq ft. 5 air cleaning levels: Sleep, Germs, General Clean, Allergen and Max for the best performance. An unique feature in the modern HFD Models of Honeywell is keeping the same appearance from version to version. This is mostly due to the really short life cycle of the Honeywell AirGenius 5 HFD320, which is popular in the North American air purifier brands, like Guardian Technologies, Honeywell and Austin Air. Following the same patterns, Honeywell AirGenius 5 HFD320 keeps the same size of 27-inch tower air purifier, with the same design philosophy as Honeywell AirGenius 4 HFD310, which is starting to feel a little dated. If you were hoping for something radically different, then prepare to be disappointed. There is no change between the Honeywell AirGenius 5 HFD320 with the predecessor, and put them aside, no one can tell the difference. You will still have a big air intake from the back and one air outlet grill on the front. Yeah, that’s the same air flow system concept from the very first HFD Model, and still continue on this Honeywell AirGenius 5 HFD320. Again, the minor change is only from the top controller, with a more Advance Timer button and one more level of fan speed setting. Honeywell AirGenius 5 HFD320 is only 13 lbs, which is the same with HFD300 and HFD310. Personally, I can’t tell why Honeywell doesn’t stop selling the old models if the difference is too small to see. On the Air Filtration front, Honeywell AirGenius 5 HFD320 is using the same air filter as the predecessors, which is a 2-stage air filtration system with the core of ifD air filter. Pre-filter – Honeywell AirGenius 5 HFD320 uses a normal pre-filter. This pre-filter can capture larger particles before they enter the ifD filter. Also, the pre-filter is washable, and therefore, permanent. ifD filter – The Honeywell AirGenius 5 HFD320 uses an unique ifD filter to capture up to 99.9% of down to 0.3 microns contaminant particles like pet dander, mold, viruses, bacteria and pollen. This air filter adds an Activated Carbon filter to help deodorize the air and reduce the odors. The unique ifD air filter, which stands for Intense Field Dielectric, is running across all of these. I’d like to think they will be all the same air purifier at nearly all the point, but judging by the slight more fan power in this Honeywell AirGenius 5 HFD320, the performance rating test is a little bit sliding over this air purifier. The ifD air filter is a breakthrough, permanent filtration method that is highly effective against all types of airborne particles which are larger than 0.3 microns. Again, I set up a test in a room of 150 sq ft, with this Honeywell AirGenius 5 HFD320 and Honeywell AirGenius 4 HFD310, and let them run for 1 hour. To have a better comparison, I even put both Honeywell HFD-010 and Honeywell HFD-120-Q to my test, so you can see the difference between the new models and the old ones. Just as I expected, both the Honeywell AirGenius 5 HFD320 and HFD310 had the highest efficiency of 90% to deal with all allergens as small as 0.3 microns. The HFD-010 can only capture 78%, and for the HFD-120-Q, 87%. It shows clearly that the HFD Models are inferior to HPA Models of Honeywell. For example, a Honeywell HPA250B has an efficiency of 99.95% in a room of 150 sq ft. It works like an ionic air filter, and therefore, can emit a trace amounts of ozone. Once again, there is still no on/off button for the ionic feature, and I highly recommend that users with asthma or other breathing issues should avoid using this Honeywell AirGenius 5 HFD320 to stay safe. The ifD air filter HRF-K2 is a permanent air filter, and will remove the inevitable annual filter cost from other True HEPA devices. Also, it is only $17, and if you want to purchase a new filter, you won’t need to think twice. Honeywelll AirGenius 5 HFD320 is using exactly the same fan from the Honeywell AirGenius 4 HFD310. The room coverage is about 250 sq ft, which is staying the same for the trio of HFD Models. The ACH of Honeywell AirGenius 5 HFD320 is 5x. With such high ACH rating, Honeywell AirGenius 5 HFD320 can clean your room every 12 minutes. The CADR of Honeywell AirGenius 5 HFD320 is 160 Dust/ 161 Smoke/ 170 Pollen (cfm). With such CADR rating, this air purifier can clean your room a bit faster than Blueair Sense+ and GermGuardian CDAP5500BCA, but not so much, though. There is one advantage for not having True HEPA filter in your air purifier – the silence of its fan. It’s really difficult for a good True HEPA air purifier to deliver a quiet noise level. Luckily, thanks to the ifD air filter, Honeywell AirGenius 5 HFD320 (and others in HFD Models) is really quiet. With 5 fan speeds, the Honeywell AirGenius 5 HFD320 is a must-have air purifier in any quiet places, such as your office or bedroom. As one of the most criteria when deciding to buy an air purifier, our most FAQ is “Do air purifiers use a lot of energy?” In fact, air purifier must be used for a long time to be efficient. Honeywell AirGenius 5 HFD320 has the same power consumption as the HFD300 and HFD310, with maximum power consumption is only 38W. For doubling the fan power of the Best Seller in 2019 – Levoit LV-H132, this air purifier only consumes the same energy amount. Well, if you really need to reserve the energy, Honeywell AirGenius 5 HFD320 is good for you. For using a Honeywell AirGenius 5 HFD320 8 hours per day, it would cost you up to $14 per year. 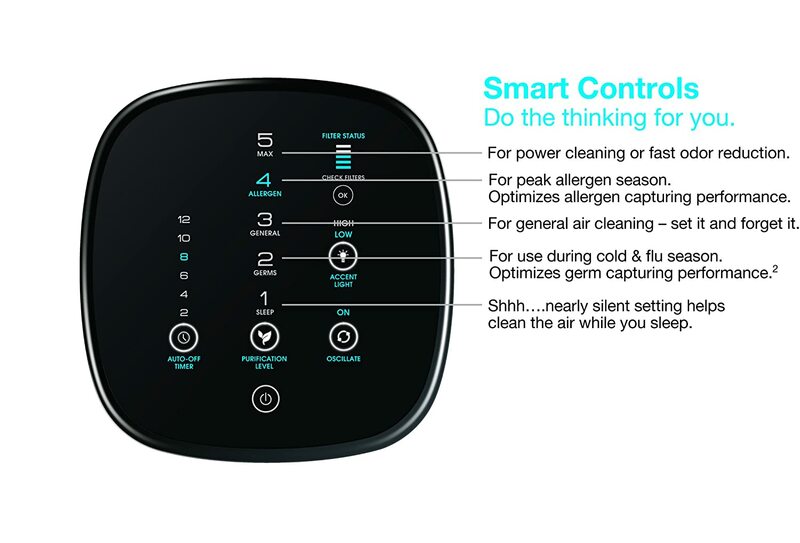 Honeywell AirGenius 5 HFD320 comes with the same typical additional features as the predecessor, like an oscillation function button to help move the air forth and back. The Advanced Timer is now up to 12 hours with more settings, and you still have the Accent Light function. However, there is still no smart features like Smart Sensor or Wifi connectivity. For the price, both the GermGuardian CDAP5500BCA or Blueair Sense+ can provide you with these luxury features. It is really a big minus for Honeywell AirGenius 5 HFD320, especially when the performance rating of this air purifier is not a big jump from the previous model. If you are looking for a Smart flagship air purifier of Honeywell, you need to search for Honeywell HPA 600B. Finally, we will have a LED indicator to know the filter status. It is really necessary because we don’t want to remember the date manually. It is really difficult to tell which you should buy the Honeywell AirGenius 5 HFD320 or not. If you prefer the high performance, Honeywell HPA300 or Coway AP-1512HH are some better alternatives with more reasonable prices. Or you are looking for a smart device within $200, you should look for GermGuardian CDAP5500BCA or Blueair Sense+. Whatever you value more, the Honeywell AirGenius 5 HFD320 is clearly not for you. Should I buy Honeywell AirGenius 5? Maybe no, as there are a lot better air purifiers our there, like the Honeywell HPA250B or Blueair Sense+. If you have serious allergies or asthma to airborne pollutants: the Honeywell AirGenius 5 has an ifD air filter, which is not as good as the True HEPA filter. If you need an air purifier with a better room coverage: you can choose the SilverOnyx, Alen Paralda or Alen T500 with manufacturer’s suggested room size of 500 sq ft. Or buying the Blue Pure 211 is okay, as it can clean a room of 540 sq ft. If you need a budget version of this air purifier: you should opt in for the Honeywell AirGenius 4 or Honeywell AirGenius 3. If you care about the annual filter cost and energy cost: the Honeywell AirGenius 5 has the most affordable air filter for the price. If you love the additional features: you can get the Blueair Sense+, Honeywell HPA250B or GermGuardian CDAP5500BCA, for both Smart Sensor and Wifi capability. Or if you just need the Smart Sensor, an investment in Winix C535, Winix 5300-2 or Winix 5500-2 is a lot better. Still not a viable option for 2019, unless you can buy a cheap one.